Click on “Report This Place” link in the pop-up for the business as shown above and you’ll get a “Report this Place” screen below. Select “Other” and let them know that the data is wrong. Submit the correct info and wait. It will likely take them a while to update it, but that’s the breaks when it comes to maps, right? 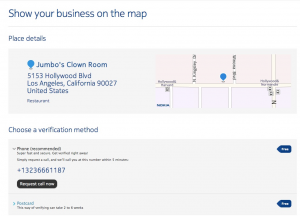 Update August 2017 – Nokia Maps is no longerGo Nokia Prime Place and you can easily submit a new business and verify it via postcard. I just submitted mine today. I’ll update this post when I receive the postcard. If you try to add a business via Here, it’s a bit more confusing. If you are outside the US, you can go into the “Map Creator” section, zoom in on a city and click on “Add a New Place” in the nav. There are about 100+ countries that are currently supported including Palau and Equatorial Guinea. At this point there is no clear way to add a U.S.-based business to Here.net if it’s not already listed. I am trying to figure out how they are getting their business listing data for each country. My best guess at the moment is this list of partners for Earthmine, the 3D mapping company Nokia has acquired. If anyone has any better info, please share in the comments. Will update this as I figure Nokia maps out. Nokia Maps is now known as HERE Maps. Therefore if you want to add a business on HERE Maps, you can do that via Prime Place portal http://primeplace.nokia.com As soon as you verify your business it will show up on HERE Maps. Thanks Catalin. For what it’s worth, at least in the US, I think “HERE” is a weak choice for a brand. It’s too generic. And the fact that you need to go to Nokia Prime Place to add your business to HERE Maps is confusing for people who are not familiar with the service. Think I’ll have to write a new post on that subject. I wouldn’t hold your breath! I have 5 businesses that I have registered with Prime Place, I have had the postcards over 3 weeks ago to verify. Still waiting for the listing to appear on Here. Nokia’s support is not existent, I just keep going round in circles with them. Tearing my hair out! Sorry to hear about that John. I wouldn’t be surprised if Nokia only updates its business listings index sporadically like once/month, if that. Can you keep us posted as to when the listings go live? Its very strange, All the businesses have been verified (over 3 weeks ago) 3 are appearing on HERE. 2 are not. and only 1 out of the five have so far made it to Bing, any clues? I haven’t dug into how Bing matches up its data. Could be a conflict with another Bing data supplier. Yes, It’s getting Bing to investigate the problem, I have contacted them various times and they just pass me onto Nokia support, who just refer to a scripted reply. Been a while since I posted this but yep, Nokia Maps is toast. Updated the post. Thanks!